With its elegant white trumpet flowers, spiny seed capsules, and fragrant evening blooms, Jimsonweed ranks as one of my favorite butterfly garden plants. The native datura inoxia partners well with another favorite, Cowpen Daisy. Plant them together and you’ll have sprays of yellow and white blooms throughout the scorching summer, well into October. Both plants gracefully defy our brutal heat, need little water or care, resist disease and pests and attract butterflies and moths. Jimsonweed climbs to three feet and spreads an equal distance. It creates a handy shady mass that protects less sturdy plants. 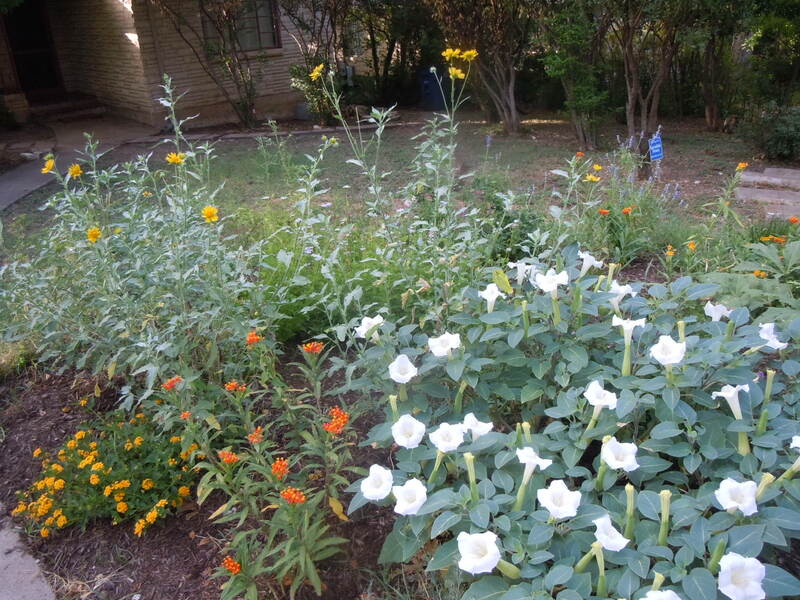 Up until this past week, Jimsonweed’s shade shielded verbena from frying and saved my tropical milkweed, too. The plant is versatile, attractive and easy-to-grow. Jimsonweed bloom. Do you see the caterpillar? What else does this member of the potato family have to offer? Its spiny seed pods provide an unusual garnish–or should I say gardenish? The thorny balls would make delightful earrings, or at least play a starring role in an exotic ikebana flower display. As summer wears on, the walnut-sized pods turn from green to brown, spreading seed wantonly in the garden, making this durable perennial almost impossible to defeat once established. The lush, large leaves of Jimsonweed also exude a chocolatey smell when watered or handled. Another bonus: the captivating Sphinx moth, whose large size and brazen daytime flying cause it to be confused with small hummingbirds, hosts on Jimsonweed. Sphinx moth caterpillars have a reputation with tomato gardeners as the despised tomato or tobacco hornworm, which is beautiful upon close inspection. Look for it in the photo of the Jimsonweed bloom, above. Underappreciated Jimsonweed does have a down side. As a member of the nightshade family, it contains tropane alkaloids, the same toxins as belladonna, used in ancient times on poison-tipped arrows. All parts of Jimsonweed are poisonous. Native Americans used the leaves as a painkiller and as an hallucinogen. 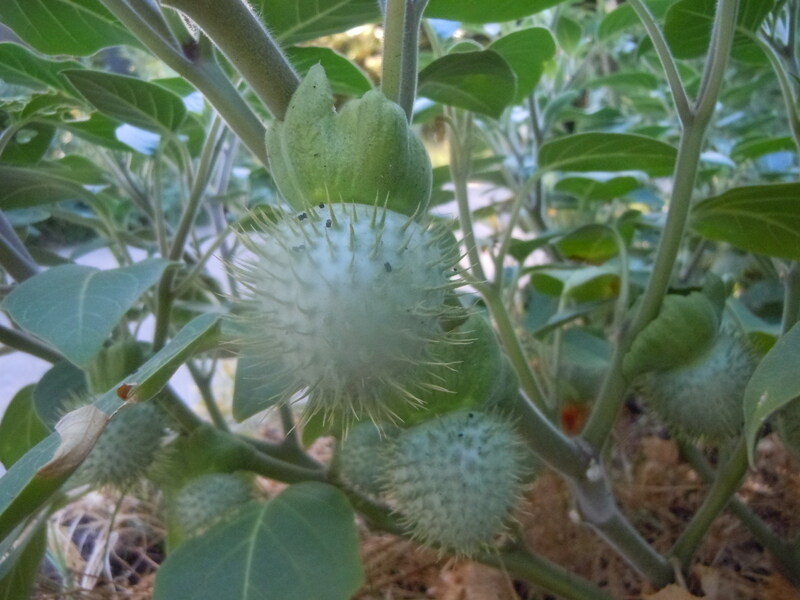 Recent reports have reckless teens using Jimsonweed as a cheap high, but they should beware. Hospital stays, even death, can result. They survived, but hallucinated severely for eleven days, giving Virginia colonists a temporary upper hand. The assisting plant became known as Jamestown weed, and later, Jimsonweed. Ken, I have a Sphinx Moth cocoon with your name on it. Interesting piece–took me about 5 minutes to find the caterpillar. GREAT story about the etymology of Jimsonweed! That one’s going to come out a a cocktail party some night. Wonderful article! 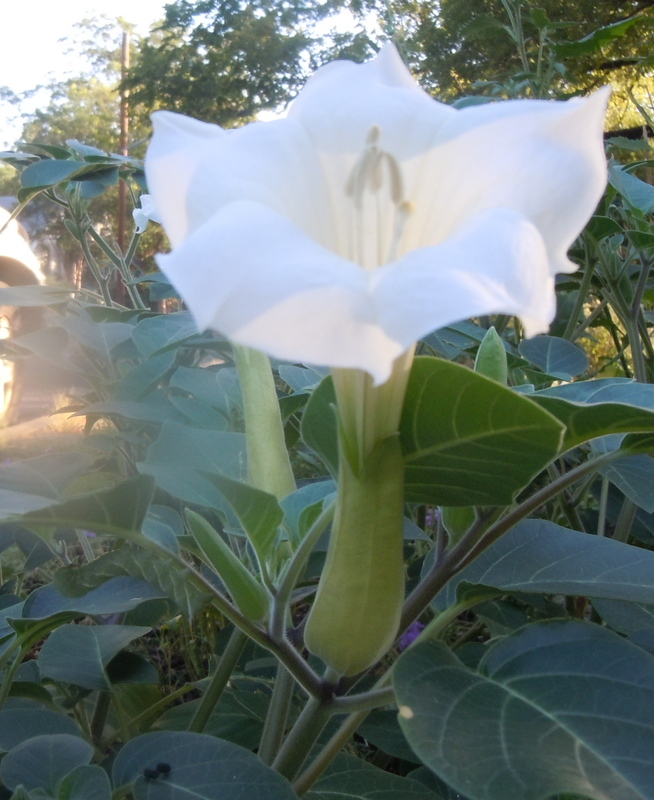 Noticed my Jimsonweed plant closest to my front door had about 100 blooms on it open this morning as I took off to walk to work… It’s amazing how large and lush it is. I love the purple-tinted soft fuzzy stems too! Also, a reminder if anyone is looking for a start of seeds for the native species listed, here they are from Native American Seed (local Texas seed company). Thanks for the info, Emily. Curious what your fave “underappreciated” butterfly garden plant is.